The species is restricted to southern and eastern England north to Yorkshire. It is widespread in north-western and central Europe, but has not been recorded from Ireland. The spider is mainly found on the branches of pine trees, also on yew and Douglas fir. It has been found on broad-leaved trees in mixed woodland and coniferised ancient woodland sites, and is frequent on pine in heathland areas in Norfolk, Suffolk, Surrey and Hampshire. It has also been found by beating yews and other evergreen trees and bushes in urban parks, churchyards and suburban cemeteries in Leicestershire. Adults of both sexes have been found from May to July. 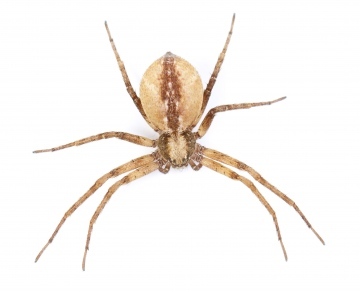 The spider is uncommon but it may be frequent where it occurs. The association with coniferous trees in woodland and on heathland in southern England suggests the species might decline with improved heathland management to control pine invasion and with the reversion of coniferised woods in southern England to broad-leaved woodland. When coniferised woods are harvested and reversion to broad-leaved woodland takes place, some mature coniferous trees should be retained at the edge of clearings or rides.